The Eschaton was Essential "Covenantal"
In a recent article, companion to this one, we noted the impossibility of maintaining the view that the eschaton was local, or historically confined to events in Palestine. In that article, we saw that numerous texts depict the day of Christ’s eschatological coming as world-wide; a time when all nations would feel the rod of his correction. In this article, we want to look at the second major corrective Preterism needs to make: the assumption that the eschaton was essentially covenantal. Though some preterists might be horrified at the suggestion, might we understand the creation of the "heavens and earth" in Genesis 1 as a direct reference to the covenant creation of Israel during the time of Moses? If that were the case, the creation account would better be understood primarily within the context of Israel’s history, rather than cosmologically. It may be speaking about the creation of the Garden of Eden which is typological of the Promised Land. But the implication is that a universal, cosmological reading of Genesis 1 is not warranted. We might interpret the heavens and earth in reference to the covenant creation of Israel, but that is not the question. The question is did God intend us to so interpret it? If he did not intend it to be interpreted that way, none dare impose such interpretation upon the text; to do so is to effectively re-write scripture by assigning unwarranted definitions to its terms. That it was not so intended is clearly seen from Exodus 20:11, where Moses, in explaining why the sixth day of each week was set aside as a time of national rest for the Jews, states that “in six days the Lord God made the heavens, the earth, the sea, and all that in them is.” Moses, who wrote the Genesis creation account, not only treats it literally, precluding us from making it figurative, but treats it as a past event, precluding it from being turned into a mystical account of the covenantal creation of Israel, which was only just occurring at the time he spoke these words. How can events in Genesis, which Moses treats as already past, recount events in Exodus that were still in the future? But we digress. The point is not whether the creation account was intended to be understood literally in terms of time and event (it was); the point is the improper and insupportable use of scripture by Preterists in spiritualizing things like the “heavens and earth,” making them take on covenantal significance. Unfortunately, this “covenantalizing” doesn’t stop at creation. We are told, moreover, the flood is not about God’s universal anger with the sons of Adam (God saw that the wickedness of man was great in the earth, and that every imagination of the thoughts of his heart was only evil continually – Gen. 6:5), but his anger with a single race of people who broke covenant with him, prompting him to bring in a local or regional flood! If we are self-consciously covenantal, we will not first ask, “What is the literal meaning of this text?’ nor ‘What does science say about a global flood?” We will first say, “Let’s examine these same constructs as used elsewhere in the Bible and interpret this Scripture in light of the rest of Scripture. Scripture is not ours to do with as we will. In interpreting a writing, we move away from the literal meaning only as the author intends and context requires. But the above writer ignores normal rules of hermeneutics, and urges that we consciously impose a covenantal interpretation upon the text merely because certain “constructs” (in this case, the terms “heaven and earth”) occur in the passage. The outcome of this method is only too predictable: everything will quickly become “covenantal.” And, of course, that is precisely the problem: in our rush to prove the second coming of Christ occurred in the events culminating in the destruction of Jerusalem in A.D. 70, we tend to impose a covenantal hermeneutic and paradigm upon the divine text, until there is almost nothing that is not susceptible to being “covenantalized.” There are very distinct dangers in this approach, which, unfortunately, has become standard among many Preterists. Not only do we rest the word of God and open the way for enemies of Preterism to detract from the essential truth of fulfilled eschatology, but an improper use of scripture opens the door to all sorts of errors. For example, there are even those that, having covenantalized the whole of creation, proceed to covenantalize the lusts of the flesh, man’s soul, hell and destruction, the resurrection, and very death itself, saying that all referred solely and exclusively to the Mosaic law and the world of Judaism! Related to the “end of the world” and “death” is the controversial issue of “losing the soul.” We find Jesus discussing them all in Matthew 16:24-27. “Then Jesus said to His disciples, "If anyone wishes to come after Me, he must deny himself, and take up his cross and follow Me. For whoever wishes to save his life [soul, according to the old economy] will lose it; but whoever loses his life [soul, according to the old economy] for My sake will find it [according to the new] This “world” is the same “world” that John said was “passing away.” It is the old economy. Here we see the soul is attached to the world that passed away. This requires the soul to be seen as a covenantal identity. Just as people were separated from God without their say in the matter because of Adam’s sin (in the old economy), in the new world people are reconciled to God without any say in the matter… Faith in Christ, though it no longer includes delivering one from that covenantal hell because that covenantal judgment is in the past, is still critical today for one to have peace, close relationship, and fellowship with God in this life on earth. We have taken this survey to get an idea of the lengths to which a local and covenantal eschaton have been taken, and why I say we have a problem that needs correction. Let us now turn our attention to the correctives. The problems we have identified and the correctives I want to suggest are more or less logical corollaries of one another. An essentially covenantal eschaton – one that holds that the end times had mostly to do with the change of the Old Testament to the New Testament – fits nicely in a paradigm that is local. We can interpret the age, the land, the earth, the heavens, the elements, and a hundred other things in reference to Judea and the Old Testament comfortably in a paradigm that sees the eschaton confined to Palestine. But an eschaton like we have been describing does not work very well in a paradigm that is world-wide. The two simply do not fit together very well; there are too many characters and too many events going on in a world-wide paradigm to allow us to say the eschaton was predominately covenantal. For example, how do you make the defeat of the beast in Rome and Asia fit within a local and covenantal paradigm situated in Jerusalem and Judea? How do you make the subjugation of the image in Nebuchadnezzar’s dream, which by definition represented the world governments of the inhabited earth, fit within a local and covenantal paradigm? How do you make Christ’s dominion over all nations local? How do you make it covenantal? How do you make Paul’s statement to the Athenians (Acts 17:30, 31) that God was about to judge the cosmos in righteousness by Jesus Christ local? How do you make it covenantal? Thus, we see that as soon as we open our view to take in the world-wide aspect of the eschaton, we also have to adjust our assumption that it was essentially or predominately covenantal. We should state at the outset that the eschaton was in fact partly covenantal. One only has to read the book of Hebrews to see that this is so. The whole book turns upon the hinge of the changing covenants, and it is also plainly eschatological. (Cf. Heb. 10:37; 12:22, 27) However, allowing that the eschaton was partly covenantal, we need to decide what parts were, and what parts were not covenantal. How do we sort it out? What do we mean when we say covenantal? The first way something can be covenantal is when it is symbol for the Old or New Testaments. Oftentimes this occurs in the context of prophetic imagery or in metaphoric language. We see this when people say the land or the heavens and earth are symbols for the old law or the New Testament. Those that argue for a mystical, covenantal account of creation and a regional flood do so, in part, based upon reverse reasoning about the heavens and earth: they think the heavens and earth are symbols for the Old and New Testaments; therefore, when Genesis mentions the heavens and earth, they say “Voila!” Local & covenantal! A second way something can be covenantal is where it pertains to or occurs in consequence of the Old Testament. For example, the priesthood and temple were covenantal (although they were also typical). Jerusalem’s desolation may also be deemed covenantal in the sense that it was the due reward for her violation of the Old Testament curses. A third way something can be covenantal is for it to describe a condition that is essentially legal. A covenant is a legal arrangement, similar to a contract. A covenant differs from a contract in that covenants are solemnized by oaths and an appeal to God as a witness or party to the compact. This is the way it is used by individuals like Max King; King argues the Old Testament was the very state, and power of death, and that the resurrection was therefore legal and covenantal, consisting in the abolition of the Old Covenant and ratification of the New. It is also one of the false premises underlying “Comprehensive Grace” and other Universalistic gospels preached in Preterist circles these days: If the Old Testament is the state and power of death, then with its removal what remains but for all men to be justified? 3) The coming in of the New Testament with its attendant legal benefits. The legal benefits of the New Testament, which came in fullness at the eschaton, are described various ways, such as redemption, justification, adoption, manifestation of the sons of God, marriage, and the eschatological change - but they point to the same thing: the consummation of God’s redemptive purpose at the eschaton. Thus, unless it can be characterized as belonging to these three -1) The fall of Jerusalem, 2) the removal of the old law, and 3) the coming in of the New Testament with its attendant legal benefits - it probably was not covenantal. Having noted some of the ways in which the eschaton was covenantal (indeed, probably the only ways), let us proceed to note ways in which it was not covenantal. First, Christ’s coming would be judicial and retributive – Christ would judge the quick and the dead; he would render everyman according to his works; those that opposed the gospel and persecuted the church would suffer plagues and wrath. In our previous article, we surveyed a catalogue of Roman disasters, detailing some of the retribution visited upon the world at Christ’s coming. It was a time of universal tribulation: famines, wars, pestilences, storms, political upheavals, military and navel disasters, which rocked the world and shook it to its very foundations. Italy was ruined; it was leveled by the storms and blasts of civil war of those competing for the empire; there were five emperors in 1 yr. 22 days; hundreds of thousands of Romans died; fifty thousand perished in Vespasian’s siege of Rome alone. 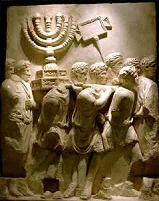 The same year that saw Jerusalem and its temple destroyed saw Rome besieged and its temple destroyed. The two greatest temples in the world thus perished in heaven’s outpouring of wrath upon the disobedience of man. Obviously, none of this had any connection with the Old Testament or can fairly be styled covenantal. Second, Christ’s coming would be imperial and militant - Christ was extending the dominion of his throne over every people, language, and nation. The necks of his enemies among both Jews and Romans would be put beneath his feet. One has only to ponder a world ruled by the likes of a Tiberius, a Caligula, or a Nero to appreciate how desperately mankind required a new beginning, a new day; yet where was it to come, if not from Christianity? And what more could contribute to its birth than the cataclysms of the eschaton and the horrendous suffering of the martyrs? The image of Christian virgins uncovered to vulgar eye, torn by wild dogs in the arena, gored by maddened bulls, burnt alive upon crucifixes, or slain as spectacles in the theatre, all the while protesting their innocence and affirming their humble faith in Christ, fixed in the collective conscience of the world the impression of a truth greater than Nero, a truth greater than Rome; a truth that could not be conquered; a truth that animated, sustained and transcended all earthly existence. Forty years from the eschaton and Pliny would write Trajan from Cappadocia that the pagan temples and sacrifices were all but abandoned and all men gone over the new faith. Again, there is nothing that can remotely be characterized as “covenantal” here. Fourth, Christ’s coming would herald the resurrection of the dead - We sometimes hear of the resurrection being covenantal, but this is wrong. The notion of a corporate body resurrection that was covenantal is a favorite child of Universalism; it spiritualizes the resurrection and places it on this side of eternity, where there is no objective basis to determine its participants, opening the way for false claims that all men have been justified apart from obedience to the gospel. Two of the earliest known full Preterist books make use of the corporate body approach to the resurrection and are written by men who either were, or shortly became, adherents of Universalism. However, Revelation portrays the eschatological resurrection of souls from Hades as actual, personal, and spatial, not covenantal. These are all ways in which the eschaton was neither local nor covenantal. But we are not through; there remains for our consideration the new Jerusalem and the new heavens and earth. A common interpretation among Preterists is the notion that the heavens and earth and their elements that passed away at the eschaton were symbols of the Old Testament and that the new heavens and earth are the New Testament. This is wrong. The city, the new Jerusalem, is covenantal – it is the covenantal habitation of the saints; the heavens and earth are not covenantal. The city is a symbol for the church or bride and is plainly covenantal; the walls, gates, and foundations of the city probably are also covenantal, and likely represent the teaching and doctrine – the legal terms and conditions - upon which the city stands and by which men enter covenantal relationship with God. The rest of the things in the city - the tree of life, the river of life, the streets of gold - can probably be characterized as covenantal, being symbols for various aspects of the gospel or New Testament. God’s presence in the city – like that of the saints themselves - is also probably legal and covenantal. The legal barrier of sin that had separated men from God being removed, we are restored legally and covenantally to his presence in the church. “Looking upon the carcasses of their enemies” answers the image in Ezekiel after the eschatological battle of Gog and Magog (the persecution under Nero) where the church goes about figuratively to bury the multitude of the slain. (Ezek. 38:11-16) Both visions speak to the victory and preeminence of the church over their enemies after the eschatological crisis was past. Haggai said “I will shake the heavens, and the earth, and the sea, and the dry land; and I will shake all nations, and the desire of all nations shall come: and I will fill this house with glory.” (Hag. 2:6, 7) “Shaking all nations” answers the removal of the old heavens and earth; “filling his house with glory” speaks to the church triumphant in the new heavens and earth. Rome would decline, Constantine would embrace Christianity, and Byzantium would become the seat of eastern Christianity and most powerful empire in the world for the next thousand years. A new world – a new heavens and earth - in which Christianity mounted higher and higher soon became the undeniable reality of which we are heirs, as the following chart shows. A “covenantal” paradigm – the one Preterists have used in the past – ignores the right hand of the chart, interpreting everything locally and covenantally, including the heavens and earth. A correct view of the eschaton, however, will recognize that much, if not most, of the eschaton was neither local nor covenantal, and had more to do with establishing the reign of Christ, than the change of the Old Testament and overthrow of Jerusalem. The idea that the eschaton was predominately local and covenantal is plainly wrong. Instead, the eschaton should be viewed as world-wide and multi-faceted. Correcting our understanding to better accord with scripture represents one of the most urgent challenges facing Preterism today. This article is adapted from a speech given at the 1st Annual Carlsbad Eschatology Conference. We do not suggest there are not times when this is appropriate. In Revelation, for example, when the land is set over against the sea, it is best understood in reference to the holy land, the sea in reference to the Gentiles. However, in historical narratives such as Genesis interpreting “earth” covenantally would normally be inappropriate. The author’s intent and context must control interpretation, not the mere occurrence of a particular word or phrase. The earth is set in the heavens and, therefore, was made within the space of six days along with everything else. There is no room for a “gap” here. Beyond Creation Science, p. 12. From an article posted on Max King’s Presence Ministries web-site by David M. Timm, Grace Upon All, Oct. 5, 2006. Bracketed material in the original; emphasis added. The “corporate body” view holds that the eschatological resurrection consisted in the living saints covenantal change from “death” under the Mosaic law to life under the gospel of Christ. Robert Townley, The Second Coming A Past Event (1845, London); An Oral Debate on the Coming of the Son of Man, Endless Punishment, and Universal Salvation between Erasmus Manford and Benjamin Franklin (1860, Boston). We hope in a future article to identify the theological distortions connecting Preterism and Universalism. Preterism itself is sound; it is its distortion (like some of those discussed in this article) that has caused it to become a vehicle for Universalism. The idea that believers are in “heaven now” and already possess their resurrection bodies is frivolous (the things we can talk ourselves into!). John is abundantly clear that the city, the bride, came down out of heaven from God. It is axiomatic that if it came down out of heaven, it cannot represent the dwelling place of God above. It is the covenantal equivalence; but it is not heaven itself. Flesh and blood cannot inherit the kingdom of heaven; not until we put off our bodies in death can we actually and spatially inherit the realm above. Meanwhile, we enjoy covenantal communion with God by the blood of his Son in the church; we enter the church by repentance and baptism. (Acts 2:41, 47; I Cor. 12:13) Outside of the church (Christ) there is no salvation promised in scripture. Not to be confused with Revelation’s millennia.